In 2006 I proposed to English Heritage that they put up one of their Blue Plaques in London to the music hall legend, Florrie Forde. They were enthused and started the apparently long and arduous task of researching her life and work and homes. Florrie was born in Melbourne, Australia, in 1876 and ran away from home at sixteen to Sydney to go on the stage. There she was seen by a British star of the day who was touring Australia, GH Chirgwin and, encouraged by him, moved to London, where she made her debut at three separate halls on the same evening. Her inexhaustible vocal power and engaging personality equipped her ideally to become queen of the music hall chorus-song – amongst them “Down at the Old Bull and Bush”, “Hold your hand out, naughty boy”, “She’s a lassie from Lancashire”, “Oh!Oh! Antonio”, “It’s a long way to Tipperary”, “Pack up your troubles in your old kit bag”, “Daisy Bell” (Daisy, Daisy, give me your answer do…), “I do like to be beside the seaside”, “Fair, Fat and Forty” and many more. 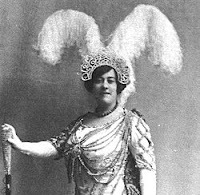 She was also a famous Principal Boy in panto and starred in the first Royal Variety Performance in 1912. Florrie Forde died in Aberdeen in April 1940 after entertaining wounded sailors. What a trouper. In his curmudgeonly poem, “Death of an Actress”, Louis MacNeice recalled her “elephantine shimmy” and “sugared wink”. Now, six years on from my original proposal, English Heritage has just dropped her from their shortlist, with the explanation that their budget has been cut and that anyway she lived mostly at Shoreham-by-Sea in Sussex. While she was working? I don’t think so. And what took them six years to discover this? No wonder their budget has been slashed. This entry was posted in early recordings, PEOPLE, recording legends, Uncategorized and tagged 1876, 1912, 1940, australia, blue plaques, english heritage, florrie forde, melbourne, music hall, roger neill, royal variety, shoreham-by-sea, sussex, sydney by Nipper. Bookmark the permalink. Try The Heritage Foundation – less prestigious, but less red tape!